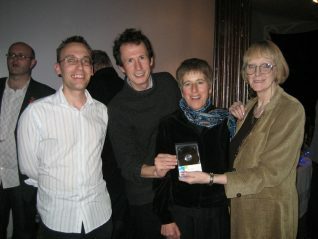 My Brighton and Hove has been awarded ‘Best Community Site’ in the 2006 Web Awards which are part of the Brighton Virtual Festival. At an ceremony at the Fabrica Gallery, Jack Latimer, the founder of My Brighton and Hove, accepted this prestigious award on behalf of the volunteer group. Previously we have won this prestigious award in 2002, 2004 and 2005, and were runners up in 2001 and 2003. It is a terrific achievement to have been successful again this year. Our record of success is unequalled in the history of these awards which are now in their sixth year. The Web Awards celebrates the creative talent behind local websites and recognises the effort put into creating good looking, interesting and user friendly sites. Sites are nominated for inclusion in the awards and shortlisted sites are chosen by a panel of industry experts. Congratulations and thanks are due to the team of volunteers who have designed, constructed, and continue to maintain the website. But – without the continuing support of online visitors, and regular contributions of memories and experiences of our city, My Brighton and Hove would not be the success it is today. So we hope that we can continue to enjoy your support in the future and please keep those contributions coming in. Well it was never in doubt at least not from me. Congrats – you deserve it. Many, many congratulations to all of you. A richly deserved acknowledgment of all the hard work done to make this such a terrific site. Here’s to many more years of keeping us entertained & informed about the old home town. I can only say well done and well deserved for the award. Being reared in Brighton this site brings back lots of memories for me and many other people. Hope it goes on and on. Best wishes to all. A winner is always a winner! Fantastic result. Well done, knew you would! It’s good to have a local interest site and so informative. Just shows how the information can be obtained from the collective minds of the readers. I think this site should win a top award every year. It is a brilliant site, so much information and memoirs from different people. I have found lots of old friends and family I didn’t know I had. So everyone keep sending in old photos and memoirs to help keep this great site going. Agreed Kathleen. Brilliant site. Many thanks to the team.